Well the HG has went on this little bugger. She is pressuring as you guys may have seen in the other thread. its already on its second engine, a low mileage one and was serviced well and coolant etc changed twice while I had it in. Dissapointed as I loved the power etc and its been fading off this last while. Lost the love for the car and have decided to revert it back to stage 1, as my wallet has fell out with me and the amount of money ive thrown at this. Stage 1 and nice looking cosmetically will probably keep me happy until I save for the next adventure. Well this went ahead with the engine swap. Lifted the engine out of the car I bought, for a quick replacement to get me to FCS. Originally I wanted to sell up the stage 2 bits but I've fallen in love with it again. So I decided to tart up a few bits for FCS. Anyone there who seen the grille will know how much of a mess it turned out lol. Gutted. And some engine bay parts. Also picked up a clean set of 6 leathers, tidies it up inside somewhat & theyre more comfortable/supportive than the dturbo trim seats. Then with the engine I took out I want to rebuild it with a bigger turbo and aim for 190+ hp. - Its going to get a new HG kit with a skim and maybe a bit of home porting. - MAYBE some better head bolts. - And then sort a 2.5 - 3" exhaust setup. Not a great deal of interest in here but a few more photos of the car after its latest clean. Yeah its taken a big back seat while I spend some much needed time with the other half due to her being home. Started work full time so have the clutch and intercooler off while I save for a turbo & maybe new intercooler setup. Have plans set in place for a big workshop build so once that's done I can carry on with the rebuild of the old engine with turbo etc & get it slapped in, just no space to be doing that sort of thing atm. Any idea what's caused the two HG failures? I'm guessing from your earlier comments about reverting to stage 1 that you didn't cook it or anything like that but rather you're suspecting that its the 2 tune just putting too much stress on the engine? There was one hg failure just. The first engine threw a rod in standard tune so can only assume it was hydrolocked at one point? The 2nd engine which got hgf was entirely my fault due to a coolant leak which I had diagnosed and didnt fix sadly. Car overheated a couple of times and was down on power/quite a bit more smokey and the cooling system was overpressurising then. Sniff test confirmed it really. Reverting to stage 1 was more due to the trip from northern ireland over to FCS and the engine was an unknown one really with 180k miles already on it. Didnt want to add in any more factors to fail before the trip just.. Such is life mate eh, fair play for doing it the right way round tbh, long-term will be well worth it. I found taking all of the overtime meant plenty of extra money and no time to spend it. Will keep an eye out for the inevitable "SHINY!!!" post in a few months. Even bought a clio dci, please forgive me, but it was for cheap tax/motoring for a month, until I got the 306 sold. But every time I go out to it and start it, it turns over first turn & purs like a kitten (albeit a loud kitten) so I just can't bare to sell it. Ive learnt so much about cars snd this engine/system, and with the money I have thrown at it it would be an utter shame to let go. Planet is on the way, so plan is to get ABS sorted finally, and get an MOT on it. Then, I will finally sort my original plans out for it. All the stage 2 goodies will be back on with a change of intercooler (to twin pass) & a nicer turbo along with a rebuilt head & new head gasket etc. Any tips on removing the head from my old engine? Baring in mind ive never done this sort of thing before. Meh, will have something nicer next year & maybe keep this too, but it seems a waste to sell on a perfectly good clutch, when I could man up and rebuild my spare engine & fire a big turbo on! Was an absolute head wreck getting it MOT ready and it would be a shame to just sell off a good example after all the hard work. Has all the potential there to be a quick motor, just needs me to get my arse in gear and do it. Talked about it for long enough. Target is 200hp by the end of january. Will be starting to buy stuff immediately. What kind of tips do you want for removing the head? Is it in the car or on a stand somewhere? Its out of the car. Just any guidelines on what may fall out where & end up where type thing. Was also wondering about the stud removal pattern as I remember the cam carrier had funky pattern/techniques. Have since been told work from the outside in but its not overly likely to warp taking it off. Ordered a bigger turbo for it, along with a neat/smaller than usual twin pass intercooler, with 2.5 inch core. Will take a bit of modifying to get both fitted right but plan is to tackle it once I have the funds, but bit by bit I will get stuff done. Started stripping the spare engine today, for some reason tapatalk won't let me upload pics. Head is off and insidenis filthy with muck/grime/rusty colour gunge as its been sat outside. Hopefully nothing too radical though & can be cleaned up/used again. Will be asking for opinions on here when the phone works again! Not giving away what turbo you gone for? Frosty, its a GT2056s , the renault variant. Been done before afaik just maybe not as much with the HDi, although feel free to correct me. Hopefully the unit itself is in good nick. Got the head off the HGF engine today and sump off the engine, need to figure out how to drop the crank out as the cylinders will need honing. When/if I hone the cylinders do I need new rings? I know that was the case with 2 stroke bikes due to compression but the same principal might not apply here, im unsure. Thanks padge, almost gave up and fell in love again. She will be a finer example soon! Cheers Paddy, will keep you posted if im stuck but luckily I have plenty of support close to home so should be ok. Thank you though, have been checking in on your project, some great work being done! Undo the rods and have the piston and rod assemblies out of the top. Remove the cambelt bottom pulley and the bolts holding in the ally end plate, slide the plate off the end of the crank. Undo the bolts holding the main bearing caps and lift them all out, bear in mind the one nearest the clutch will be hardest to remove, so would suggest doing that first. If you've still got the engine upright be careful with these as they're now all that's holding the crank in. There's a lot of conflicting opinion on whether or not you should hone the bores, i did, a lot of people told me not to bother, a similar number told me it was preferable or essential. I must admit i'm not convinced it was necessary and hasn't just caused me more work. I'd suggest contacting a local engine builder for advice and to get hold parts like bearing shells and rings, they may tell you honing isn't necessary if you use certain rings. Tips for reduced ballache: When you pull the crank be careful with it, had a lot of people warning me that they're easy to damage. Also, bear in mind all the bearing faces are mild steel, so don't touch with bare hands as it'll rust like mad. I have rusted-in finger prints on my crank thanks to a certain bellend lol. Put all your bolts in seperate compartments or boxes and label them, i've wasted whole days looking for misplaced bolts over the last few months. Spend a lot of time on youtube watching some honing guides, i found a lot of people have different methods and it took me a while to work out exactly how i wanted to do it. If you have a spare block to practice on first, do it! The only advice that was consistent everywhere was don't over-do it - you don't need to remove any material, just create a rough surface for the rings to bed in on. (21-12-2014, 09:28 AM)Poodle Wrote: Undo the rods and have the piston and rod assemblies out of the top. Remove the cambelt bottom pulley and the bolts holding in the ally end plate, slide the plate off the end of the crank. Undo the bolts holding the main bearing caps and lift them all out, bear in mind the one nearest the clutch will be hardest to remove, so would suggest doing that first. If you've still got the engine upright be careful with these as they're now all that's holding the crank in. Good man Poodle. Youre an absolute star. The engine has sat outside for some time, with no injectors in it. So inside the bores is a bit crusty & the pistons are siezed in the block. With regards to removal, do I need to keep shells etc with the correct cylinder, or should I replace these anyway? 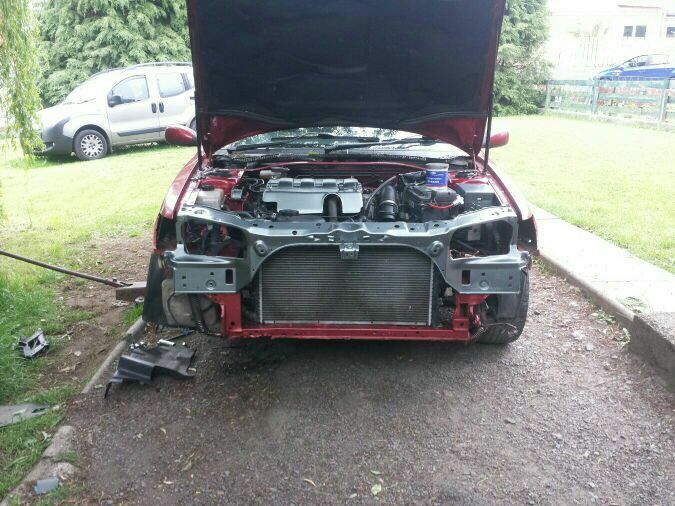 Im worried about potential damage of the engine being sat outside and whether its worth working on this engine or should I just pick up a cheap one and forget about rings etc. Will torture you with some PM's in the near future. Paddy, hoping to have her finished by end of January/early february. The work will all be done on a spare engine, with the idea of throwing it in on the weekend and getting any finishing touches etc completed then (hopefully). I have a clio to get me around so I can keep that provided this doesnt get too expensive meaning I can take my time. If it's been sat full of water i'd be checking everything for rust tbh mate, much sign of corrosion on bearing faces and she'll need serious work. Be cheaper and easier at that point to buy another engine. You'll need new rings if they're rusted in and probably need new shells too by the sound of it. When taking it apart keep everything allocated to the correct cylinder, if it's worth keeping. I wished i'd taken pictures as i went, partly for the project thread, but mostly because i couldn't remember how stuff went together.